Does Your Backyard Patio Embarrass You In Front Of Family And Friends? Your patio is the heart and soul of your outdoor lifestyle. It’s where you meet with friends, enjoy a meal with your family, or savour your morning coffee. It’s also the focal point of your landscape, and it takes a thoughtful, unique design to truly bring your backyard to life. Here in Victoria, we’re lucky to be able to enjoy our patios year round. Sure, it can get a little wet, but it’s nothing a high-quality stone patio can’t handle. Interlocking brick patio pavers offer the ultimate in beauty, versatility and durability. In addition to performing flawlessly in any season, interlocking patio bricks are low maintenance and attractive, are an affordable alternative to concrete, and are an excellent long-term investment for any backyard. They come in a wide range of colours, shapes and textures that not only provide much-needed functionality in your outdoor area, but also complement and enhance the surrounding architecture and landscape. If you need help polishing your vision or don’t know where to start, don’t worry. That’s why we’re here. We’re committed to detail and craftsmanship with every patio paver installation, and are passionate about architectural landscape design. Our talented designer will show you past projects and give you unique, thoughtful inspiration. Together, you’ll uncover a show stopping style that suits not only your backyard, but also your needs, your wants and your budget. Here at Rooster Brick, we want nothing more than to transform your home and enrich your outdoor lifestyle. We specialize in interlocking brick paving stone systems and have years of experience in installing and designing custom patio pavers that boost your property value and provide you with years of enjoyment. We only manage a few projects at a time to ensure you receive the highest quality work and the full attention of our highly creative and technical staff. We’re ICPI (Interlocking Concrete Pavement Institute) certified in bricklaying and AquaPave installation, and only use the highest quality materials. 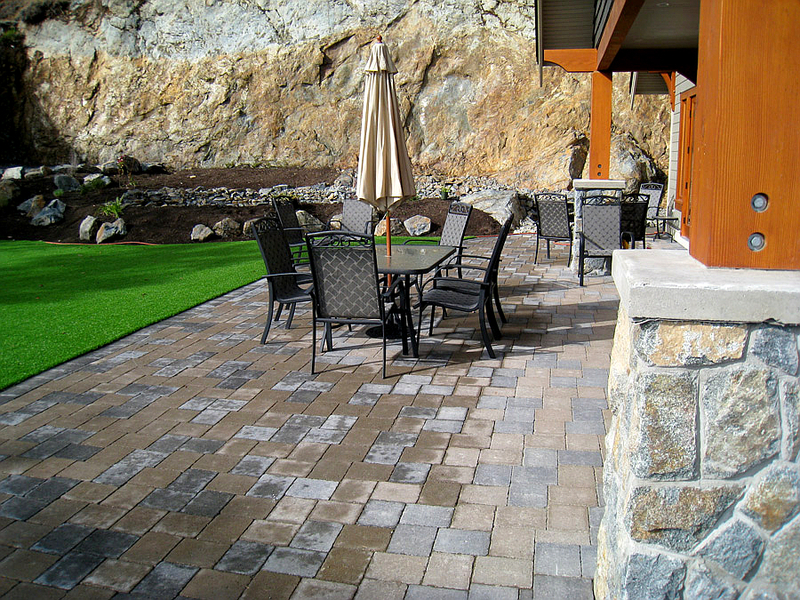 All of our interlocking patio pavers are made right here in British Columbia and are manufactured with a special finish that ensures lasting beauty and protects your investment for many years to come. Whether you’re looking for a peaceful retreat, an extension of your living space, or an inviting spot where friends and family can gather, Rooster Brick can make your dream patio a reality. 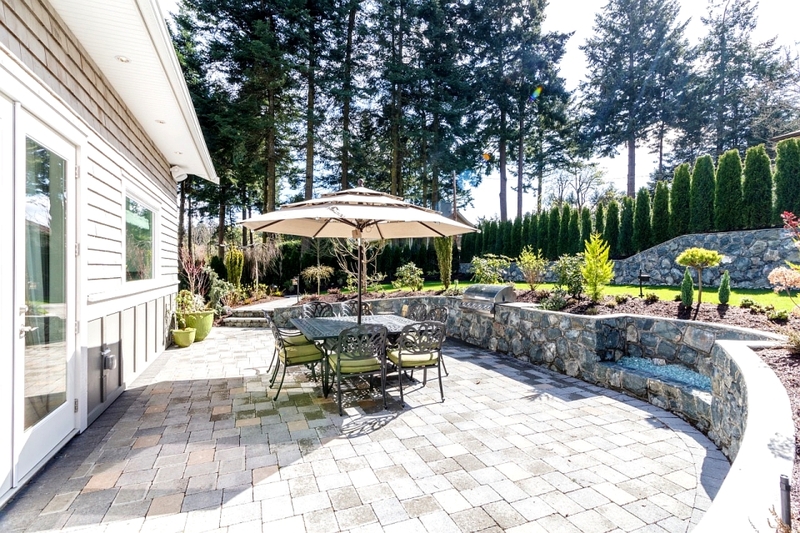 If you’d like to learn more about the enduring beauty, versatility and durability of interlocking patio pavers, we encourage you to contact us in Victoria BC for a free estimate (250-889-6655). This letter is to let you know how delighted we are with our new patio and front walkway. 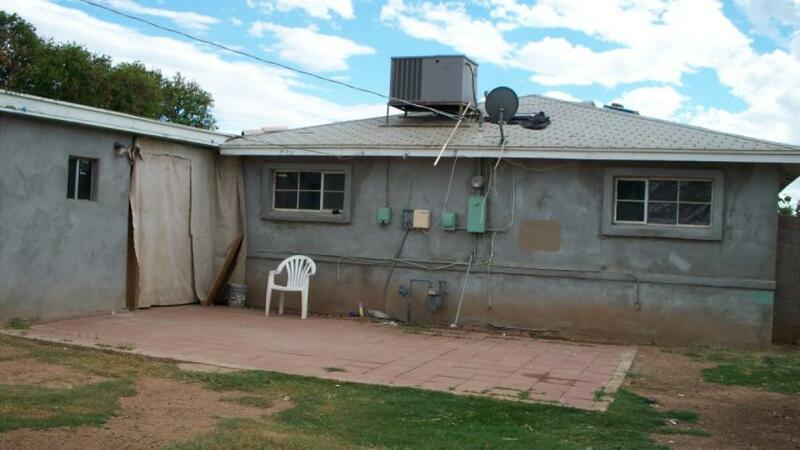 These home improvements have enhanced our property and were done in such a timely fashion. From your initial visit and then the crew, Matt, Brad and Slade, we were impressed with the professionalism, creativity, friendliness, fast and efficient work ethic. We are happy to recommend Rooster Interlocking Brick to anyone who is thinking about upgrading any outside area of their home. Thank you to you and your crew - The patio looks great, just how I envisioned. Looking forward to sitting out there in the warmth, surrounded by our garden. Wanted to also thank you for our new brick wonderland... the kids are enjoying it, it's creating a safe play space out of the street, we can finally park cars in the driveway, it looks fantastic, the neighbours all say it's lovely, and it made a great centre of operations for our wedding. It's the gift that keeps on giving. And we had some outrageously hard rain a few w eeks back, must have been a centimetre a minute! I poked my head out the window to see how the driveway was draining and there was my neighbour who had needed all of the reassurance, standing on her porch watching too. Well, it was a sight to behold. The water ran down to the street EXACTLY as you had described it would, and boy, was she impressed! I think I wouldn't have watched so closely had it not been for her concerns, as I didn't worry about it myself, but that was great to see. Thanks again. Every day we have more fun on our property that is made possible by the work you guys did. Hooray!!! Coming home from work each day to see the transformation of our backyard was like being on the TV show Extreme Makeover. Now the paver patio and new landscaping is done we are loving our summer at home. Thank you to the Rooster crew. "IT'S LIKE DRIVING UP TO A NEW HOME" Rooster is a team that promise the best, and they more than deliver... 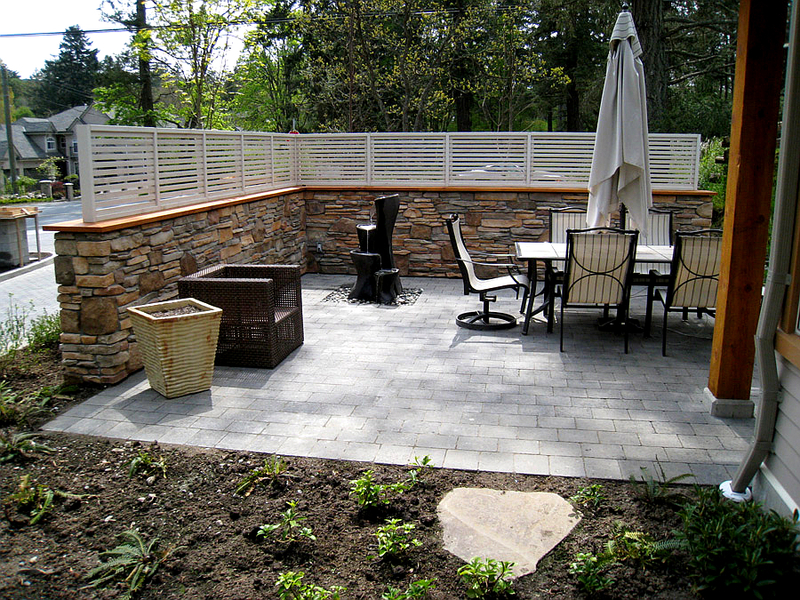 If you are considering a driveway or patio for your home Rooster will not disappoint you.. I would like to thank Dallas and his crew for their professional and efficient service. Dallas and his crew did an exceptional job and transformed our property into something spectacular. I have received an overwhelming amount of compliments on my new driveway and landscaping. I will continue to recommend Rooster Interlocking Brick to all of my friends and neighbors. We were so impressed by work done on a neighbours driveway that we engaged "the Roosters" to do the same forus. This included a driveway and patio. Their leader, Dallas, promised the work would be completed in a week, which surprised us. It was, in fact, completed in 6 days by a team of conscientious, hard working, friendly workers with an attention to detail and excellence. We are greatly impressed. I can recommend the "Roosters" for their outstanding excellence of work, very reasonable pricing and speed, without reservation. Come and have a look at 618 Oliver Street, Oak Bay, Victoria. A hat will be passed round!